I worked on it with Seungran and Sunghun. 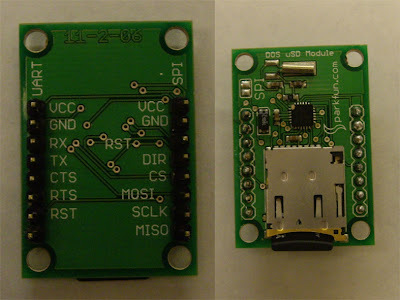 We ordered a DOSon chip and a micro SDcard from sparkfun( DOSon CHIP). Here is a picture of it. And we connected it to an arduino. First, we tried to use a toggle switch for a reset button but for some reasons it was not working so I made a circuit without it. 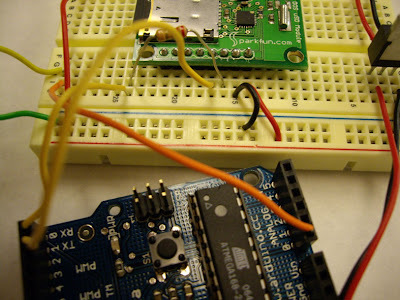 And we also connected a pot to an analog pin 0 to get some value. 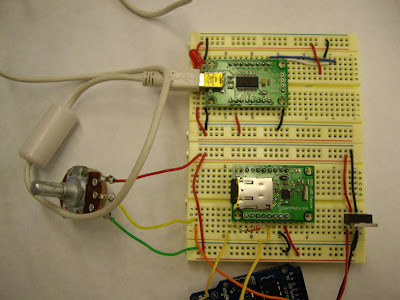 We tried data logging with a sample code from the Sensor Wiki which was named 4dSystems xD Datalogger (Arduino-Processing). We got some data from the pot but it did not seem reliable because values were so unstable and also we could not save any data in the card. We were so confused, because we thought that as long as an arduino got some value (no matter if it was garbage value), it was supposed to be saved in the card. However, data file was saved in the computer. Here are the text files. Here are the code for Arduino and the results. Hi, It's been months since I boought this and I haven't been able to make it work... are you using the new API or the good old one?